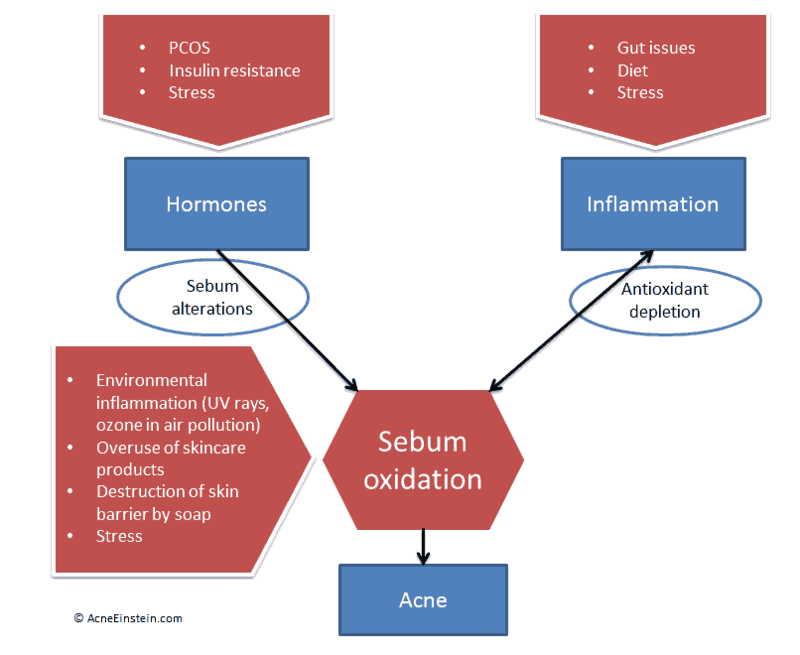 On the last page we talked about sebum oxidation and how it’s the trigger that sets off the acne formation process. We also talked about how hormones and inflammation create the conditions for sebum oxidation to take place; hormones by increasing sebum and squalene production and inflammation by depleting antioxidants that protect sebum from inflammatory damage. On this page I want to get more practical and show how to use this information to finally get over acne. Let’s start by looking at the image that explains acne. This is unfortunately where neat theory stops and messy reality begins. What we’ve talked up to this point applies to just about every single case of acne. What comes after this explains why the notion ‘you just have to find your own solution’ is so popular. Because what causes inflammation and hormone imbalances for you may be completely different than what causes them for me. The relationship between these hormones and acne can get quite complicated, and simplistic notions that ‘you have too much hormone Y and that causes acne’ are often wrong. For example, some studies have found that people with acne have increased levels of androgens as compared people with clear skin, but other studies have reported no differences. The best we can say at the moment is that some people with acne may have increased levels of these hormones, but in others it comes down to how sensitive the skin is to the hormones. One of the more consistent findings is the role insulin and IGF-1 play in acne. Insulin resistance seems to be a fairly common among people with adult acne. A study from 2012 showed that men with adult acne had 2 fold higher fasting and 4 fold higher post-meal insulin levels than people with clear skin. In women the data is more conflicting. Those with PCOS usually also show increased levels of insulin, but we can’t generalize and say that all women with adult acne have abnormally high insulin level. Another point supporting the role of insulin comes from diet-acne studies. All studies that showed reduction in acne used diets that reduced blood sugar and insulin levels. What works for hormonal acne? Exercise and weight loss (for people who are above normal weight); for people who are already thin exercising too much or restricting calories can make things worse. Avoiding sugar and high glycemic index carbohydrates. Reducing carbohydrates and eating more fat and protein. Women who are thin and have PCOS features, it might be a good idea to avoid phytoestrogens (soy, flaxseeds and some other plant foods). Vitamin D (especially for women). As we discussed on the previous page, people with acne have higher level of inflammation and lower levels of antioxidants than people with clear skin. Part of the reason is that increased sebum production strains the antioxidant system, and if there’s something else that also increases inflammation, then the antioxidant system may not be able to cope with the demand. Gut problems – I believe gut problems are one of the most underappreciated causes of acne. Studies show gut problems are far more prevalent in people with acne than in people with clear skin. My acne is linked to gut and refused to clear until I made the connection. Now my skin remains clear as long as I don’t eat or do anything that aggravates my gut. Eating too much sugar and simple carbs, especially when combined with insulin resistance. Avoiding processed food and eating more fruits and vegetables. Avoiding sugar and refined carbohydrates. 3 to 5 cups of green tea per day. Let’s not forget that acne is still a skin disease and proper topical care is a big part of the solution. The problem is that most people approach topical treatments the wrong way. They focus too much on killing bacteria and peeling the skin. That’s why popular skincare products have you heaping benzoyl peroxide on top of benzoyl peroxide. Use topical antioxidants to prevent sebum oxidation and stop acne before it even gets started. Use mild acids like salicylic acid or AHAs to exfoliate the skin. Use green tea other ‘DHT blockers’ to reduce your skin’s sensitivity to hormones. Several studies have shown DHT blockers can reduce sebum production by 30% to 40% in people with oily skin. Use moisturizers to repair skin barrier and protect the skin. Cautiously use benzoyl peroxide or other antibacterial agents to control bacteria and breakouts. It may seem like you need a cabinet full of creams to manage all that, but keep in mind that you don’t necessarily need check all the boxes. For example, I rarely use BP anymore. You can also combine things, for example, by getting a moisturizer with green tea and/or antioxidants. Science has conclusively shown that inflammatory damage to sebum sets off a cascading reaction that ends in a painful pimple. The more inflammatory damage skin suffers, the bigger a pimple you’ll get. Consequently, studies show good results with anti-inflammatory treatments. If you’ve been expecting some secrets that will get rid of your acne, I’m sorry to disappoint you. There are none. Those who hawk quick fixes and overnight cures are more interested in clearing your wallet than your skin. 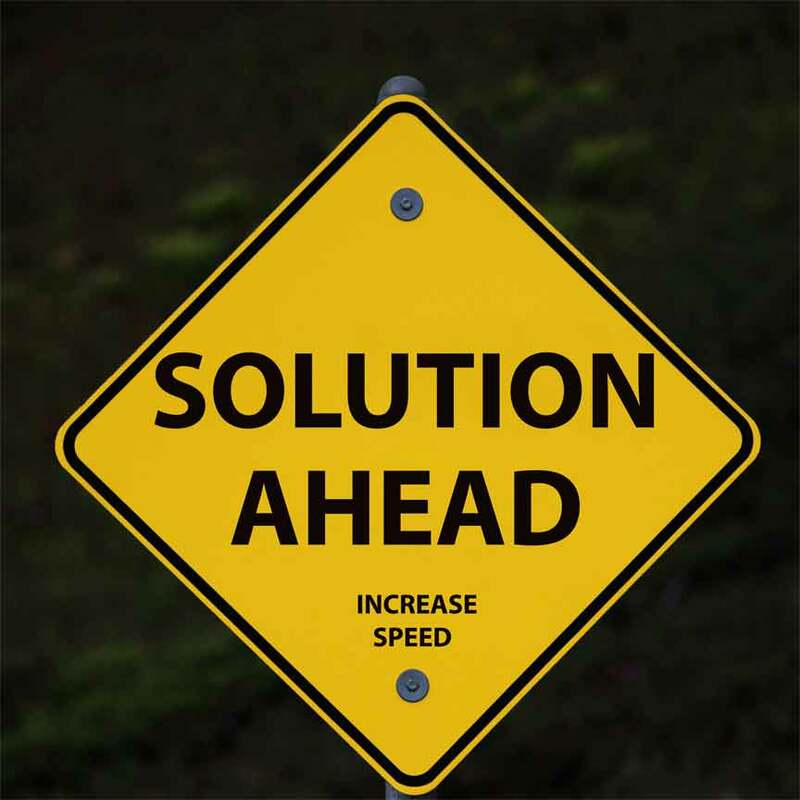 What do YOU need to do to get clear? Nobody can say in advance, that’s the honest truth. There are some things that are likely to help almost everyone with acne; these are things that reduce inflammation. And then there are things that help some acne patients but do nothing for others. It’s your job to figure out what areas you need to focus on and which actions get you results. For that you need some trial and error. As an example, you may need to cut gluten out of your diet for a few weeks to see if it helps. If nothing changes, then you can reintroduce gluten and stop worrying about it. It would be easy for me to tell you to cut out all the bad foods from your diet and only eat really healthy foods. But back here in the real world life comes with pressures and obligations, and I know that many (most) wouldn’t be able to follow such. So the advice would not only be useless for you but might even make you feel like a loser for not being able to follow through. I can think of more than a few cases where such dietary fear-mongering has ruined lives as people have started fearing food, feeling like everything causes acne and there’s nothing left to eat. Some have developed full-blown eating disorders. That’s why I advocate this trial and error approach. So you can find the sweet spot where you do what you need to get clear but won’t make your life too difficult. Sounds reasonable? All of the above may feel overwhelming and you may not even know where to get started. In that case you should check out my Clear for Life – Science-based natural acne treatment program book. Foods that cause acne and diets that work the best for acne. How stress affects your skin and simple ways to reduce it. How to know if your acne is caused by gut problems and how to fix them. I’ll show you which supplements work for acne and which are just a waste of time and money. The smart way to do topical skincare so you’ll get results without irritating your skin, with specific product recommendations. And I’ll show you where to find affordable skincare products that work just as well as expensive brand name products. Every recommendation in the book is supported by scientific evidence. You won’t find any of that ‘she said, he said’ hearsay. So if you’ve been looking for simple to follow and reliable guide to getting over acne, I can guarantee you this is it. Click here to learn more about Clear for Life.